The staff at OLA is committed to enabling all students to reach their potential and to succeed. We understand that every student is unique and each must have opportunities to achieve success according to his or her own interests, abilities, and goals. The Ministry of Education has defined high expectations and standards for graduation, while introducing a range of options that allow students to learn in ways that suit them best and enable them to earn their diplomas. We are proud that our students have many opportunities to develop academically, socially, emotionally and spiritually. Over the next few weeks, teachers will be reporting on their students’ progress. The primary purpose of assessment and evaluation is to improve student learning. We know that parents have an important role to play in supporting student learning. Studies show that students perform better in school if their parents or guardians are involved in their education. This is the basis for the principle that students and parents should be kept fully informed about the student’s progress. The Elementary Progress Report Card is designed to show a student’s development of the learning skills and work habits during the fall of the school year, as well as a student’s general progress in working towards the achievement of the curriculum expectations in all subjects. The development of learning skills and work habits needed to succeed in school and in life begins early in a child’s schooling. As students move through the grades, they develop and then consolidate their learning skills and work habits in preparation for postsecondary education and the world of work. In many subjects and disciplines in Grades 1 to 12, the development of the learning skills and work habits is further strengthened through the achievement of the curriculum expectations. 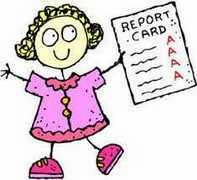 Students in Grades JK to 8 will receive one Progress Report on November 20th and all students in Grades JK-8 will receive two Report Cards (February and June). General progress in Learning Skills and Work Habits can be found on page one of the Progress Report and progress in working towards meeting the expectations in specific subject areas is noted on Page 2. At this early stage in the year, progress is recorded with descriptors rather than marks. All parents will be invited to participate in Parent-Teacher interviews so that your child’s progress can be addressed in more detail. Parent-Teacher interviews for students in grades JK-8 will be November 22nd and 23rd and they will take place in classrooms. We hope you will commend your children for the efforts that they are making and help them to plan ways to continue to improve.